It’s a noisy planet! 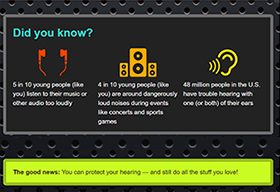 Many sounds are safe, but others can damage your hearing. Learn how loud is too loud, how to protect your hearing, and more—then test your knowledge with a crossword puzzle. Kids and preteens get tips for listening to music without damaging their hearing. Noise is everywhere. Learn which sounds and environments can put your hearing at risk and how to protect your hearing. Kids and preteens learn the various types of hearing protectors and tips for how to wear them. Kids and preteens learn how sound is measured, what loud sounds do to their hearing, and three easy steps to prevent noise-induced hearing loss.